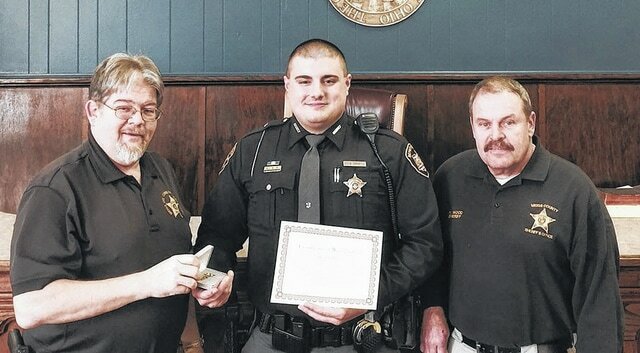 Former Meigs County sheriff’s deputy Brody Davis, center, is shown in this March 2015 photo receiving the Golden Handcuff Award from Meigs County Sheriff Keith Wood, left, and Larry Tucker, of Meigs County Common Pleas Court. POMEROY —A beloved Meigs County Sheriff’s Office deputy has resigned amid allegations of robbery, theft and dereliction of duty. Brody Davis, 26, of Pomeroy, resigned from his position as deputy after a pre-trial hearing last week in Athens County. According to Meigs County Sheriff Keith Wood, Davis turned in his voluntary resignation June 18. He had been on administrative leave since April 22 when Wood’s office received a citizen’s complaint in reference to an claim of misconduct and theft by the officer. Davis had been with the department since February 2011. Following an indictment by the Athens County grand jury on May 11, Davis was arrested on charges of second-degree robbery, third-degree grand theft when the property is a firearm, third-degree tampering with records and misdemeanor dereliction of duty. Court records of the May 12 arraignment show Davis pleaded not guilty and was released after posting $30,000, 10 percent bond. The alleged incident occurred in Athens County when Davis was on official duty to recover a vehicle stolen in Meigs County, according to a published report that cited Athens County Prosecutor Keller Blackborn. The May 11 indictment also alleges that Davis stole a gun from a man sometime during May 2014 and subsequently falsified a police report about the incident. A decorated officer, Davis earlier this year was awarded the Golden Handcuff Award from the Meigs County Common Pleas Court Community Corrections Department. He was praised for his assistance with the community corrections department, including taking 11 individuals into custody who were placed on the community corrections department’s Most Wanted list. A jury trial scheduled to begin July 16 in Athens with Judge Patrick Lang presiding.